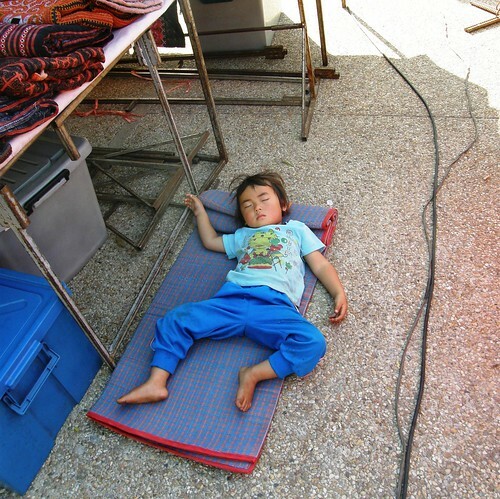 Nothing like a good afternoon nap..., originally uploaded by tgtwb. So we're gonna continue from where we left off in Melbourne. 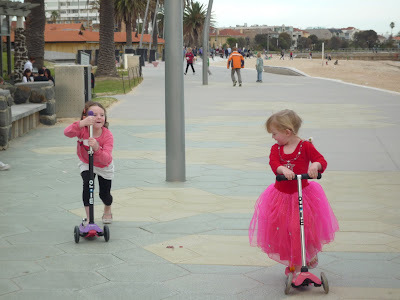 Day 4 & 5: Touring the City and Off to the Beach Town of St. Kilda We Go! So here's the deal... 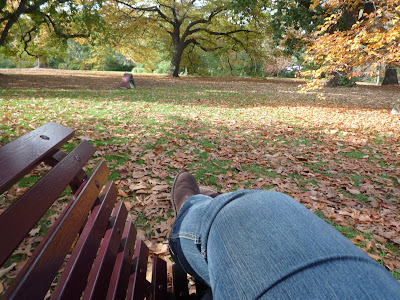 When you purchase 2 tours from the travel agent, you'll get a free City tour - that is a half-day sightseeing (mostly done while you're on the bus, but sometime you get off) to key landmarks and areas within the Melbourne CBD. This came free after we purchased GOC and the Penguin Parade tour and thank heavens it is... I'll tell you why i said that! How can this be interesting? Come on... Its Louis Vuitton... 'nuff said. Some of the places they'll take you on the tour include Federation Square (Hint: You board the bus from Fed-Square), Queen Victoria Market (lovely little paradise), Chinatown (every city has one... whaddaya see, Chinese! ), Flinders Station (famed train station next to Fed Square), Arts & Cultural Centre (across the bridge from Flinders Stn), Royal Botanic Gardens etc. 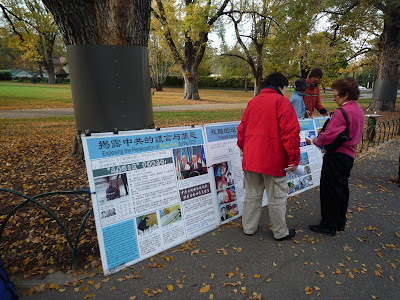 Demonstrators at Fitzroy Gardens promoting their cause. We have this back home too. 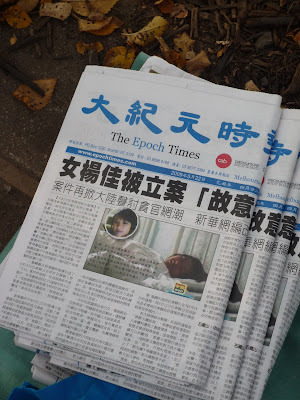 The Epoch Times. Hate the word, Epoch, by the way... Don't know why. I personally think the quality of life of children in Australia is so much better than its Asian neighbours... that's just my point of view, being a kid meself... haha! Asian parents are, sad to say, too uptight, very demanding and hard on their kids sometimes, especially when it comes to grades. 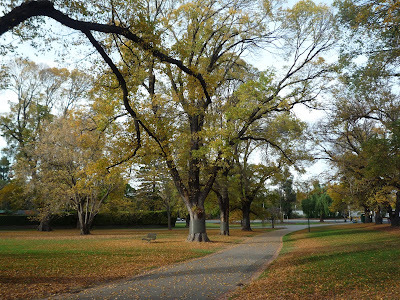 More beautiful tree-lined parks such as this one at Fitzroy Gardens. Makes for a nice walk on Sunday morning or early evenings. OK so you've heard... Cubbies didn't thoroughly enjoyed her free tour (even though she likes free stuff) and slept for the entire 3 hours journey on the bus, waking up only to pee. Besides, the commentating by the domineering "cat-woman" tour guide sucked anyway. Her monotonous yakkating and all that fake smiling and hostility - uurgh! Either that or she's simply edgy, like she's trying to quit smoking or something. So... Cubbies didn't tip her! Hmph! They also promised a souvenir at the end of the tour, but we didn't get any (maybe because its free?). After the tour ended, we went back to the hostel and checked out. Not before we had lunch first! We cooked some dinner the night before - made use of the free rice and pasta every day and finished some wrap / fish we bought couple of days back. The thing about moving place to place is that you don't quite get to "mark your territory" as often as you'd like. 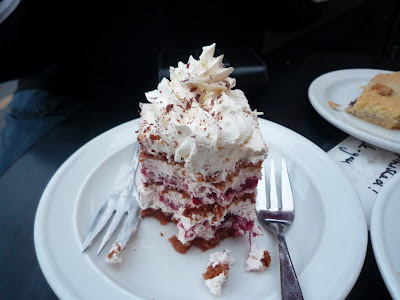 So TTT had to clear out the food before we left the hostel. Things we can reuse, we take them to St. Kilda; things we can't like leftover bread, hummus, we left it on the shelf so others can use them before it expires (you'll be surprised at the speed of which these perishables... perish!). 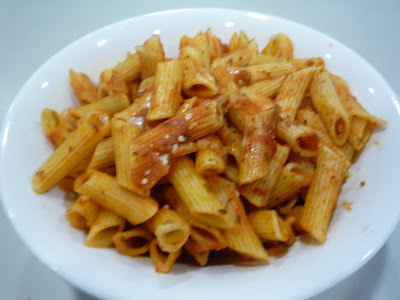 And a tad too dry pasta Arrabiata. 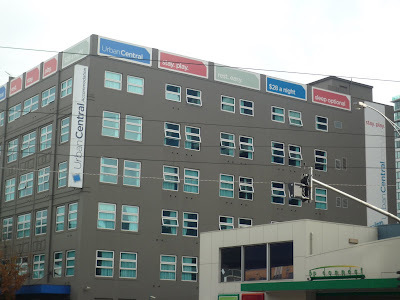 Then it was BUH-BYE Urban Central! 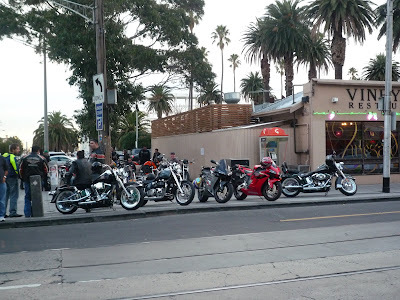 St. Kilda is 6km away from the City Centre and takes 2 tram change before you arrive at the heart of it all. All in all, from where we boarded the tram, it took us approx. 10 mins and VOILA! A club that runs from god knows when till god knows when. Especially crowded on weekend nights. 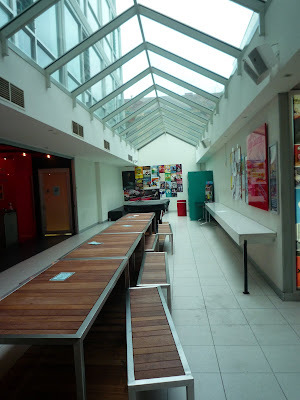 Communal area - good for merry making and reading. After a few hours of resting our tired little paws, we were out exploring the town area. Our first impression of St. Kilda??? A quaint haven, cosmetic town that is akin to all beach town the world over. Cosy little streets punctuated with palm trees, background music courtesy of street buskers, children, lollipops, cakes, fairground and to top it all off, tourists amidst the small eccentric crowd. 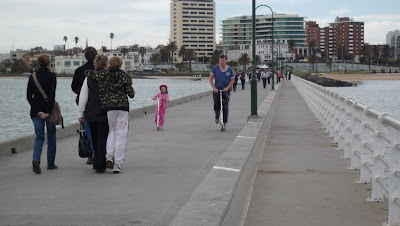 That's the beach town of St. Kilda. Main attraction - The Beach! 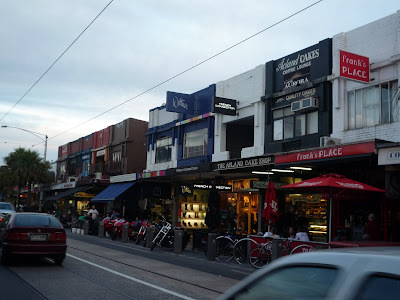 Quaint shop houses lined the streets of St. Kilda's Acland Street. Eccentric much? Harley enthusiast showcased their pride on the littered pavements - making it quite difficult for passer-bys to pass through. 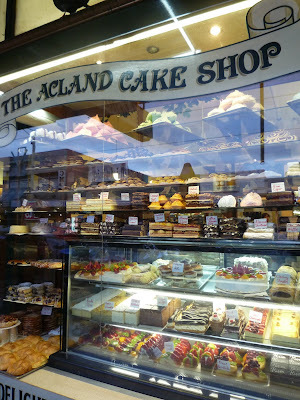 The reason why all people should be in St. Kilda - honest to goodness cakes. 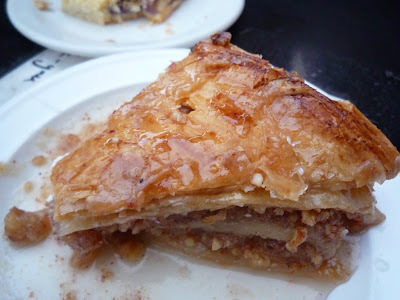 Meebops had the super-sweet Turkish pistachio halwa. 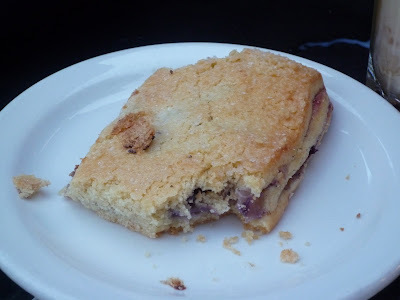 And a blueberry pie - which was simply kick-a** gorgeous. Anyway, after a glass of wine each, they both wanted to move off. Hubby who was a little stronger stood and moved off first. Wife, who was definitely very very tipsy and who has a major case of arthritis going on, with painful bony parts of her arms and and legs sticking out, stood up wobbily and PLOP to her back, down to the floor, with her head hitting the concrete curb! It was a pretty hard fall for an old lady and she MUST'VE HURT REALLY BAD but thankfully she wasn't bleeding or anything. Cubbies went rushing to her feet (like how Mighty Mouse would've donw it) and helped her up. Haizz.. It broke Cubbies' little heart to see such things happening to what was once probably a strong beautiful woman in her heydays :( So Cubbies asked if she was OK - she nodded. Then came 2 other Italian-Australian ladies who spoke to her, called the ambulance and everything and stayed till the Ambulance is in sight. TTT stayed too till everything was under control. Oooh... whatever happened to the husband you asked? He went away, disappeared. At some point he realised wife was missing, saw the commotion, walked past the old lady and pretended like he didn't know her. Yes, he's an a**. But what good can you expect from someone who care more about where he can get the next booze? 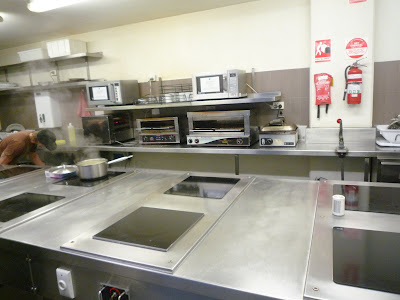 That night we cooked up a storm, God knows why. 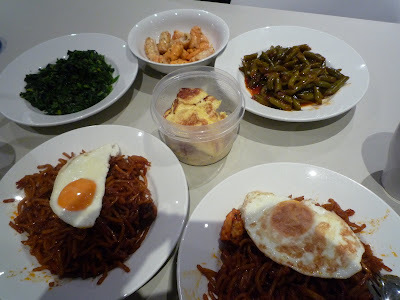 There were fried noodles (which Meebops cooked), eggs, excellent frozen spinach, and some nasty canned peas, plus, calamaris. It was a buffet! One guy commented: "I'm impressed by your cooking..."
We woke up late the next morning, had some cup-a-soup and bread breakfast and walked around the Upper and Lower Esplanade areas - all the way to the beach jetty. Entrance to Luna Park is free but rides are pay per entry. They had some Corporate event going on that Sunday so the rides are totally out. Besides, we're not crazy about thrill rides either.. heh heh heh..
What i want to do when i grow up... 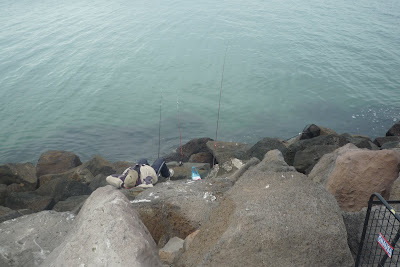 Fish and bask in the chilly winds under the sun. Doze off and find yourself in Hawaii... why not. That's right, the iconic big-mouthed clown of Luna Park. Always laughing, always welcoming. 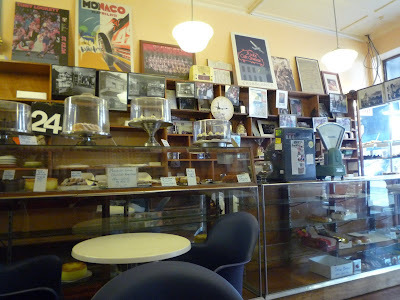 After the long stroll, we headed for our last stop before moving back to Melbourne - Monarch Cake Shop who probably had its interior preserved in a bottle and presented in a time machine. And i'm talking antiques people. 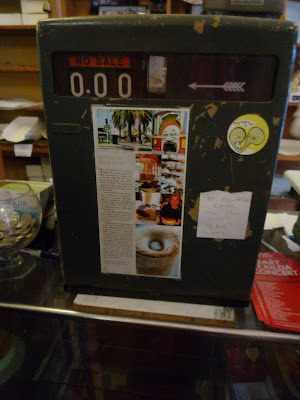 They even kept the original cash register alive and running ka-ching ka-ching! 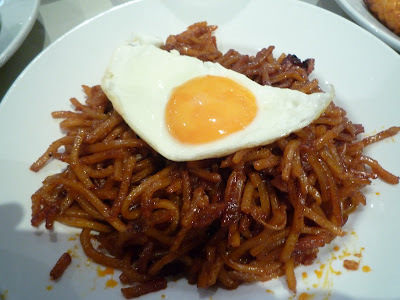 Their house speciality - the MUST TRY KUGELHOPF. Can't miss this one folks, its a must-have. 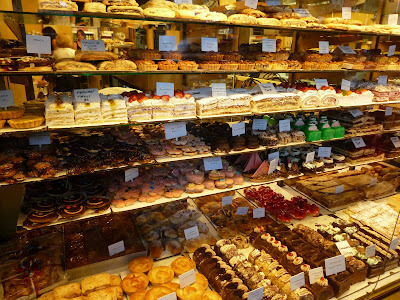 I'm drooling just thinking about it. 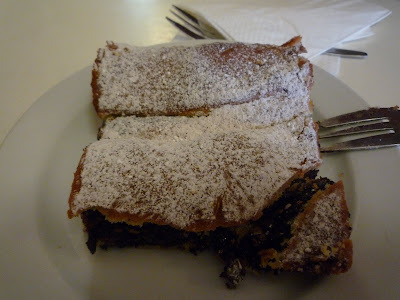 Its of Polish origins, it has chocolate fillings covered in savoury pastry... what more can you ask for? Real honest to goodness - no bull about it. So that was it! 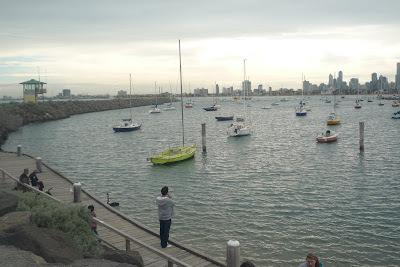 St. Kilda was a purrrfect weekend getaway for TTT - and a much needed one (after all the touring!). We packed our bags and checked out. 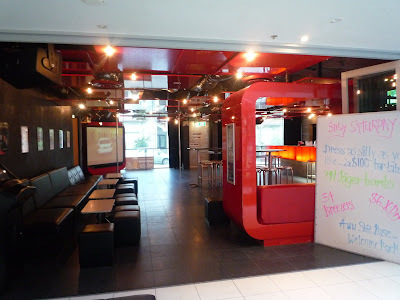 Hopped on the tram and off to our next accommodation - Pensione Hotel on Spencer Street! 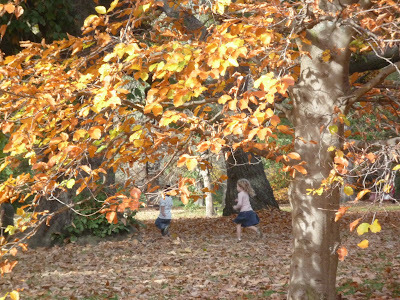 Till the next post: Day 6 & 7 - Puffing Billy, Petting Zoos and Wake Up! Its The Fire Alarm! A Street in Prague, Czech Republic, originally uploaded by tgtwb. Yup... Just a street in downtown Prague, Czech Republic. 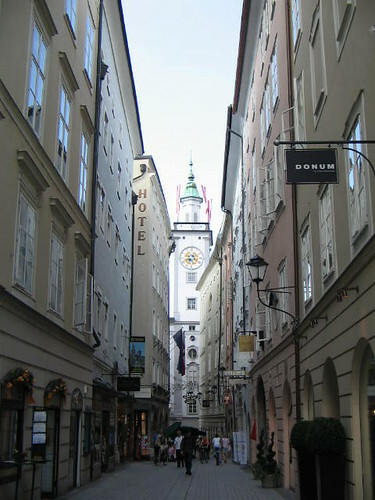 I love how the streets in Europe are all perfectly lined and linear. Although most of the cities in Europe looked like they are cut out from cookie cutters, they're really beautiful and a perfect vacation spot for LOVERS and married couples alike. 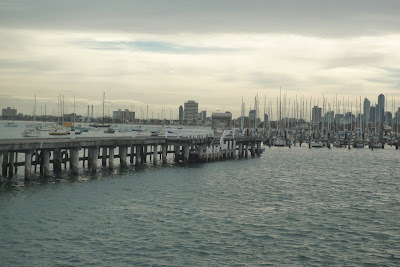 Oh yes, i'm baaack with our new post on Melbourne the Great Victorian City! :) This time with accompanying animals. 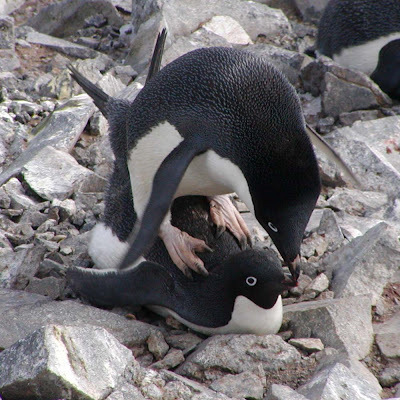 DAY 3 - Sleep-In Day and My God, Aren't Those Tiny Penguins Bloody Exhibitionists?!! 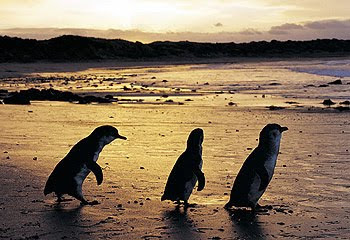 The REAL Penguin Parade tour starts only at 7pm, so the day time was spent visiting Phillip Island itself. But before that, we created a ruckus in the kitchen at Urban Central. No actually, we just made lunch! :) Some unidentifiable wrap that has some salad and whole fried breaded fish thing. Meebops refused to eat it. 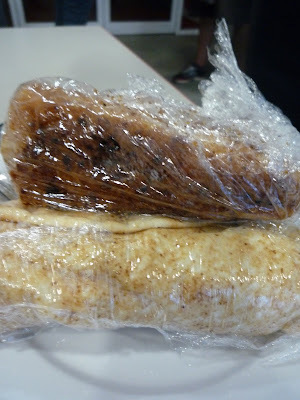 "The problem isn't in the wrap or the fish... It was the lack of ingredients!!!" Cubbies said. 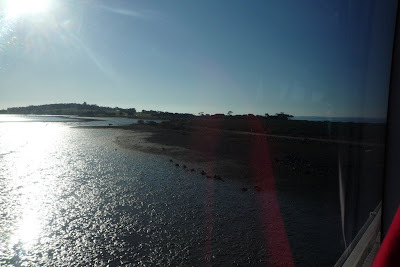 Moving along, the tour on Day 3 was very interesting i must say, cos we visited the nature park, the conservation centre, saw rocky sections of the ocean with a cute name - all to build up the anticipation of the main attraction, which was the little penguins. What did i tell you about the sun? Me don't likey. First stop was the Phillip Island Nature Park, which is really down at Churchill Island. These are some of the baby animals down at the Nature Park - they're actually really friendly and tame, so you can touch them - which Cubbies did at a moment's notice! Ummm... that's Mr. Kangoo right there... I'm just saying, maybe its a "Mr", cos he looks kind of... masculine... you know... like... Gggrrr!! Believe it or not, this was my first time touching a baby sheep!!! (ummm... so?) Ooooooooo it was fluffy, definitely very fluffy woolly... erm.. fluff. I wanted to take one home but Meebops, as usual, wouldn't allow me to. This was the sheep i stroked and played with (i literally did!). Oh very fluffy! And here's another with the wool sweater, probably taken from his cousin. Believe it or not we have no pictures of the tiny penguin parade!!! Why?! because were were not allowed to! No cameras no nothing... just eyes to witness. That is so that the penguins won't get so freaked out by the flash from those cameras and they will not want to swim back to shore. See the penguins do that on a daily basis - early morning, swim out to sea. At dusk, swim on back home to shores where homes are nestled in between the rockies and shrubs. TIP! I gotta tell you though - do put on some seriously warm outfit and long pants if you're there at any season other than maybe, summer. While it is a really fascinating experience - what with watching untamed waves crashing in front of you and the sound of hungry seagulls searching for that last catch before heading home, and you, waiting patiently for the tiny wild creatures to return back to shore - it is still an open, unrestricted ocean - and it is COLD. Victoria has one of the coldest water temperature in all of Australia, possibly because it is within close proximity to chilly chilly Tasmania down South / South-West. Somebuddy's gettin' some lovin' tonight... heh! 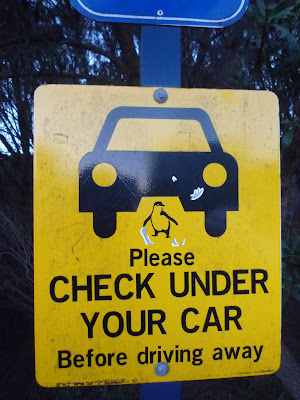 And just before you drive off - duck under your car, JUST IN CASE you find one for the record! 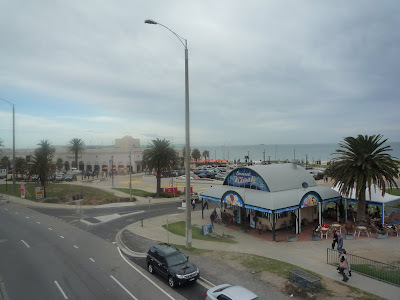 Guess i'll have to cover Day 4 & 5: Touring The City And Off To The Beach Town St. Kilda! next.